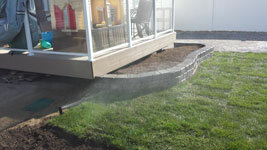 The staff at Al’s Landscaping is Regina’s irrigation specialists. We work with commercial and residential properties to ensure they receive the water they need to thrive. Our landscapers install, repair, and service sprinkler systems, including modifications as needed. These include simple sprinklers for small residential yards as well as complex systems for large commercial properties. If you currently don’t have an irrigation system, we offer full installations, including the sprinkler, faucet, underground pipes, hoses, and much more. From simple residential systems, we’ll design and install a high quality irrigation system to meet your needs. We also offer pipe pulling irrigation services, using Ditch Witch machines that can pull the pipe or wire with very little ground disturbance. All lawn sprinkler systems can be installed this way. We are able to bore under driveways and sidewalks as needed. When a cold Regina winter is closing in on your home, Al’s Landscaping provides fall sprinkler blowouts to remove water and protect the system from freezing and cracking in cold temperatures. When you’re ready to winterize your irrigation system, give us a call.